I’ll never forget the day I learned about the impact unconscious bias has on behavior. It was 2012, and I was beginning my second year in a leadership position. My eyes were wide. On that day I also reflected on how systems of oppression are in the air that we breathe. It pained and confused me to learn about things I was never taught in school. The event was hosted by the National Equity Project, an organization I’ll always be grateful for. On that day, in that conference room in Oakland, a lightbulb went off. On that day, my perspective on leadership and cultural consciousness shifted forever. On that day, I made a commitment to learn (and unlearn) as much as I possibly could—so I could be the best version of myself as a leader. Thanks to my brilliant leadership coach at the time Mark Salinas (who I had the privilege of working with for years thereafter) I became conscious of the myriad invisible tensions and opportunities that were the embedded in fabric of my context. I saw layers and micro-layers of white privilege and cultural hegemony everywhere. Blindspots were illuminated everyday. And I learned a ton leading during my time at ECP. And I’ll always have more to learn. Since then, though, my commitment to learn & lead differently took off. I haven’t stopped learning and unlearning. I’ve read up on neuroscience and adaptive leadership, I’ve surrounded myself with people who push my thinking and hold up the mirror with love. In 2016 I threw up an idea on Kickstarter for a product that would be a tool for counteracting unconscious bias (SPARK Community), and to my surprise we met our goal and were able to fund our first prototype. A year later I created a leadership framework to help other leaders uncover their blindspots and lead with integrity. To say it’s an honor to host SPARK Leadership courses, to coach, and to lead this work everyday is an understatement. When I look back and reflect on how far I’ve come since that day in 2012, I feel great pride, because I put in countless hours of hard work, energy, and I persevered when things got hard. I did all that because I have been committed to being the best leader I can possibly be. As I’ve shared more of my story and lessons-learned in the SPARK Family, folks have asked for more resources and research on unconscious bias and emotional intelligence…SO I put something together that I’m excited to share. I have limited seats available, so if you’d like a leadership-boost and want take your EI to the next level, check out my upcoming 3 week mini-course below. Got questions? I’d be happy to chat more. Comment below or send me an email at spark@rachelvrosen.com. Rachel Rosen, the founder of S.P.A.R.K. Community and S.P.A.R.K. Leadership, is on a mission to start a global conversation about inclusion, empathy, and racial equity. With a Masters from Stanford, and extensive training in leadership, coaching, team and organizational development, S.P.A.R.K. experiences are grounded in theory and practice–all in service of making the world a better place. With love. For justice. When I heard John Kelly’s recent statements on the radio, my heart started racing with rage. Hearing someone–in a position of authority in the White House–call an entire community “lazy” made my blood boil. How dare he talk about the undocumented community like that? How could he be so incredibly disconnected from reality? Our words are vehicles for our values, and his words say a LOT about his values. We can’t afford to be careless with our words OR our values for so many reasons. One of which is because the children are listening. All of them. They are sponges. What they absorb eventually seeps out into their actions and words. …so we can’t be silent. This is close to my heart because I taught many undocumented students and know DACA recipients. I’ve heard stories of college students who arrived to the United States at a very young age, who were 4.0 students (and valedictorians of their high school class)–some of the most dedicated, driven, and responsible people I know–who now commute one hour to college, who struggle to access financial aid, who can’t leave the country to visit loved ones, who have no healthcare, have never been to the dentist, have no drivers license…the list goes on. I know parents who have emergency backpacks by the door and pre-written goodbye letters, students with emergency contacts on them at all times. I’ve heard stories of confusion about the DACA paperwork, which includes questions about the time and place their parents crossed the border. From what I’ve heard, the fear of getting their parents in trouble is pervasive, persistent, and painful. I can’t begin to understand or empathize with that type of pain and anxiety. I can only listen and show up. I’ve attended events in solidarity to better learn how I can support. My new friend, Antonio, (below) couldn’t be farther from “lazy” — he’s one of the most resilient people I know. He drove 4 hours to attend a DACA event to share his inspiring story, to be in community, and to have hope. Just hope. That tomorrow could be better. That someday his dream of becoming a teacher could come true. The depth in his eyes captured so much: perseverance, pain, confusion, love, anger, sadness. Hope. So I hold his story and the powerful conversation we had close to my heart. His story adds more fuel to my fire (my moral imperative)–to resist unjust practices and statements. I feel so strongly about this because this is life or death for many students these days. Bullying and hate-crime-related incidents at schools are on the rise in an unprecedented way. It’s being referred to as The Trump Effect by the Southern Poverty Law Center. “In the immediate aftermath of the election, the Southern Poverty Law Center (SPLC) noticed a dramatic jump in hate violence and incidents of harassment and intimidation around the country. At the same time, a wave of incidents of bullying and other kinds of harassment washed over the nation’s K-12 schools. The SPLC decided to make an effort to document all of this in real time. In another article by SPLC, they note: “Ninety percent of educators report that school climate has been negatively affected, and most of them believe it will have a long-lasting impact. A full 80 percent describe heightened anxiety and concern on the part of students worried about the impact of the election on themselves and their families. Here are more facts on cyberbullying + a rise in youth suicide rates in case you’re interested. Needless to say, we have a LOT of work to do to fight this administration, to resist this divisive discourse and ALL the unjust laws and practices in our current government. So, rather than get angry and frustrated, throwing my hands up, and giving up–everyday I make a choice. I think of Antonio’s radiant resilience, and I choose radical hope. I channel his perseverance and strength, and I show up in solidarity. Because I know I’m not alone, and strength comes with unity. Because thousands and thousands of people are by my side. 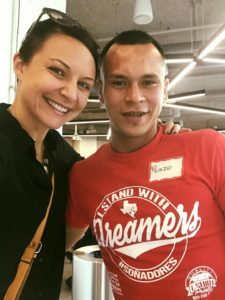 Because countless organizations like Jolt Texas, attorneys like Alfonso Maldonado Silva, and countless organizations like United We Dream, and community members on the grounds working tirelessly, advocating for the rights of undocumented citizens every day. It truly takes a village to change the conversation. We ALL can–and must–stand up and speak out against injustice for the next generation. It starts with one step. One conversation. One choice. To listen. To show up. To ask. To see. To say “that’s not how we talk about groups of people, and here’s why…” or “hurt people hurt people” over and over again to our children. To put a sign on your window saying “no human is illegal + we support DACA” to signal to our undocumented community members that they are safe and welcome in our space. To choose courage over the comfort. It starts with one choice. So what is one choice you will make today? Please comment below and/or share with friends. Also, if you have other resources to share or ideas for organizing, please contact at spark@rachelvrosen.com. Are you a Catalyzer or Controller? The language we use matters. So does the delivery of it. As a basketball fan, I’ve come to realize there is a spectrum of two types of coaches: Catalytic champions and Controlling directors. Controllers need order. They focus on what’s not working. Power, attention, and ego drive their moves. Catalyzers acknowledge progress. They praise the team, encourage reflection, and champion other people’s ideas. I remember watching a middle school basketball game and observing the stark contrast of coaching styles. One coach was screaming, pacing, red in the face, and even got a technical foul for yelling at the referee. The team mirrored back the energy of their coach; several players fouled out, the team ran fewer plays, with more players putting themselves (and their layup, their jump shot, etc.) first before the success of the team. At one point the coach yelled, “Take down the shooter!” There was no respect, sportsmanship or civility. The other coach, however, was calmly encouraging and smiling, while sitting on the bench. His team gave each other more high-fives, smiled more, and executed more plays. These were middle school students. I recall a very specific incident when I was teaching. I found myself at a stand-off with a 14 year old student one day. “Dang, why are you yelling, Ms. Rosen?” the student asked. “Why do you look so irritated though? Somebody woke up on the wrong side of the bed…” she said as other kids snickered. Did I not sleep enough? Was i projecting my issues onto my kids? Why was I doing all the things I knew not to do? When I held up the mirror and reflected on the situation, I didn’t like the controller I had become. I had always wanted to be an inspiring, loving teacher. I never wanted to be perceived as angry. I had to humble myself and go see how Ms. Dixon handled her classroom management. In my experience, at some point, we teachers/leaders/coaches inevitably project our stuff onto teams they support. We’re imperfect human beings with complex and multifaceted pains, experiences, and struggles. At some point our pain is going to seep out into our communities. How we navigate and work to minimize those moments matters. Ms. Dixon (as well as numerous, brilliant basketball coaches) taught me that being a calm, catalyzing champion for your team’s success means that you win every game–no matter the score. I made a commitment that day to be a leader who supports, uplifts, and who is a guide on the side for my champions. I hope to always allow my team to discover their unique strengths…without projecting my issues. S– Show up authentically. Share your intentions, values, and hopes in a real way. Remember to show up as you. R- Respect diversity. Let the differences on the team harmonize like a good song. K– Kindly expect tension. Messiness is a part of the game. Control and order don’t drive transformation. The world needs more catalyzers. Through intentional habits, decisions, and moves we can move closer to being the leaders we desire to be. Leave a comment below with the answer to these questions and what they bring up for you as inspiration or motivation to make a change in your own leadership style. Can you think of a time in your life when you taught/led/coached/parented from a place of control / frustration? How did it make you feel? Now, can you think of a time when someone helped you learn and grow with grace? Rachel Rosen, the founder of S.P.A.R.K. Community and S.P.A.R.K. Leadership, is on a mission to start a global conversation about inclusion, empathy, and racial equity. With a Masters from Stanford, and extensive training in leadership, coaching, team and organizational development, S.P.A.R.K. experiences are grounded in theory and practice–all in service of making the world a better place. With love. For justice. Want to know your SPARK Leadership strengths and growth areas? Check out our self-assessment here. PS- For the next few weeks I have carved out space to support more leaders. 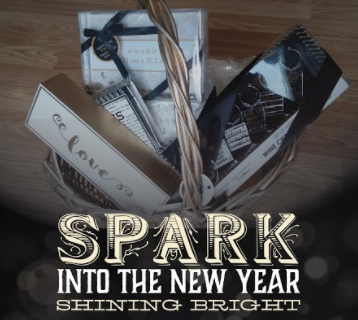 If you’d like to talk more about what SPARK being a Catalytic Leader looks like, it would be my honor to support you. Feel free to book your 20 minute complimentary strategy session here. When I first started teaching, I would try to get my students’ attention by yelling, “listen up” or “alright everybody” and repeatedly be frustrated when they wouldn’t stop everything immediately. Someone gave me a chime to ring and shared some nonverbal ways of getting students’ attention without having to bust my vocal chords. Interestingly, the dynamic of the class improved immediately. Even years later, though I am no longer teaching, I think back to my first years teaching a lot. In some ways, we adults aren’t all that much different than children when it comes to our learning and engagement needs. If we’re working in groups and are asked to do an exercise that requires communicating, most of us follow the prompts and engage. Like students, we struggle to give our undivided attention when the facilitator/speaker tries to regain the groups focus to move on. I believe that we’re all doing our best with the skills and tools that we have, and sometimes the little details (that we don’t know about) make the world of a difference. Think about the tone you want to set. What’s the first thing you want people to see/feel/experience when they enter your space? Play music that matches the vibe you intend to foster, and think about the colors/images support that. Make space for different body-types to feel comfortable if possible. (ie. have different sized chairs, pillows on the ground, and even invite people to stand if they’d like) That creates more of a liberatory environment. C. Framing & closing matters. How we set up the experience impacts everything. As an event leader, it is important to frame the event. At the beginning, share why you’re putting on this event and the expected/desired outcomes. To close the event, remind participants of the outcomes and allow space for participants to both reflect and connect to one another. I highly encourage the leaders I work with to use feedback forms to understand how participants experienced the event. This can be as fancy as a pre-filled out form with intentional questions or as simple as handing folks an index card or blank piece of paper with one question/prompt: How did you experience today’s event? D. Think beyond your voice. Take a cue from YMCA camps, “If you can hear me clap once” (clap) “If you can hear me, clap twice.” (clap twice). Science suggests that 18 minutes is really our maximum for maintaining undivided attention, so I aspire to use the 20 minute rule in all that I do. Minimize talking to 20 minutes or less. Set a timer and after 20 minutes, invite people to say something out-loud to their neighbor. This can be just 30-60 seconds, yet it energizes the room, connects participants, and allows for increased cognitive understanding. I could go on and on, but I’ll stop there for now, as I believe strengthening those five areas will lead to subtle but powerful game-changers for your next event. What does this spark for YOU? In the comments below, share a recent experience (positive or negative) of how a dynamic speaker impacted your experience an event. Rachel Rosen is on a mission to start a global conversation about inclusion, empathy, and racial equity. She helps courageous leaders uncover their blindspots and take their diverse team to the next level with intentionality and integrity. With a Masters from Stanford, and extensive training in leadership, coaching, team and organizational development, S.P.A.R.K. experiences are grounded in theory and practice. Check out your SPARK score here. I can certainly relate! The demands, needs, and requests that we, leaders, face can lead us to a state of overwhelm–which impacts our ability to think clearly, communicate confidently, and to be comfortable with change. After 6 years of coaching leaders and supporting hundreds of folks to address their biggest challenges, I’ve discovered a pattern. I call this pattern the 5 Power-C’s. These five things can negatively impact, disrupt, and disturb our state of flow if we’re not careful. Sometimes we are challenged by one of the above. Other times they all five hit us like a tsunami. A client told me recently that she felt like she could barely keep her head above water. She had been hit by the tsunami of all five. Her desk and inbox was overflowing and she didn’t have the headspace to think clearly. She cares deeply about racial equity and inclusion and was particularly concerned about what to say after one of her employees said something culturally insensitive in a meeting. She noticed that she was avoiding following up with the employee. She also felt like the moral was low on her team and she couldn’t put a pin on WHY. I asked her what her hunch was about why it may feel that way. While constant change was contributing to overwhelm and low morale, the only thing that’s absolutely predictable is that change will happen. The good news: once we see a pattern in how we are addressing change, we can identify better solutions for approaching change. 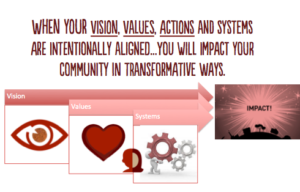 With intentional leadership, we align our vision, values, systems, and actions for maximal impact. In my 10 week coaching program, we address each of these Power-C’s in detail. The first step, is to normalize that change is inevitable and an integral PART of the work. When we recalibrate our expectations for embracing inevitable (even unexpected) changes and shifts in dynamics, we’re less reactive and more responsive. Being an intentional leader means anticipating the need to adapt and being flexible with our community. When we reframe our beliefs/thoughts we see change as something that can be on our side. We see it as an ally, and we can even remove “change” from the tsunami list. In my 10 week coaching program we engage around William Bridges’ research on the phases of change and transitions, which is an invaluable tool and resource. Conflict is also inevitable with group dynamics. In fact William Tuckman’s research on team dynamic suggests that “storming” is a natural part of new community processes. Again, if we recalibrate our expectation and see conflict as a sign and signal of progress, we have more headspace to engage meaningfully. Easier said than done, I know. Growing up in Texas, I was conditioned to avoid conflict, be polite, brush things under the rug, and put on a happy face. I call myself a “recovering people-pleaser” for a reason. Brains science suggests that we’re wired to avoid discomfort and most conflict causes discomfort, so it’s not intuitive to lean-in. However, when we expect conflict to be a part of the process, then we realize we really just need to strengthen our communication skills as leaders striving to be emotionally and socially intelligent. David Rock’s research on neuroleadership is invaluable. What is your purpose / desired outcome of this conversation? How do you want to be experienced? How do you want to listen? 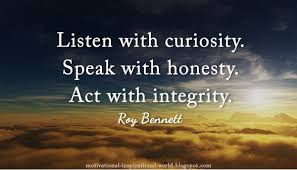 Which of your core values connects to this conversation? How will you follow up after this conversation to make sure you’re on the same page? The systems you have in place that will allow your vision, values, and priorities to consistently be tended to. The number one pitfall I see leaders make is misdiagnosing the problem they’re trying to solve. They see those symptoms and they diagnose the problem externally, usually because they don’t have the tools or skills to know what to do. There was a time when I didn’t understand why people weren’t engaging on the deep, meaningful level that I wanted them to. I tried everything. I brought ice-breakers in, we played games, I took them to happy hour. Still, the dynamic was off. Diagnosing the stage of your team dynamic is critical. That’s where Tuckman’s work is invaluable. Here’s a brief overview of the four stages. Which of the Power-C’s do you struggle with? I would love to hear from you. Leave a comment below. Also, if you’re interested in putting some of these into practice, I’m hosting a power-packed online workshop/webinar on December 12, from 5:30-7:00 PST, and I’d love you to join. Click here to register. Rachel Rosen is a seasoned Facilitator, Executive Coach, Consultant, Racial Justice and LGBTQ activist, and the Founder of S.P.A.R.K. Leadership and S.P.A.R.K. Community. Rachel is on a mission to start a global conversation about inclusion, empathy, and racial equity. With a Masters from Stanford, and extensive training in leadership, coaching, team and organizational development, S.P.A.R.K. offers experiences that support leaders and teams to unleash their potential to facilitate powerful experiences, collaborate, and build trust–all in service of building a better tomorrow. Want to discover your Leadership SPARK Status? Take this self-assessment to learn more! What Does An Iceberg Have To Do With Inclusion? Will Your Inclusion Iceberg Capsize Your Success? How many of us have heard a top Executive / Administrator say they value diversity and inclusion? I know I have. Saying those words is a start, because it implies there is awareness of the value. Action, however, is what separates the strongest organizations from the rest. The strongest organizations, most with diversity/inclusion as core values, have practices, policies, and structures in place that are intentionally designed to embed and uplift and hear multiple perspectives in meaningful ways. These organizations understand, value, and practice equitable and fair employee promotions, transparency in information, access to leadership, support for employees’ personal lives, inclusiveness and connection between colleagues and with leadership. They act with integrity and take action to affect their employees positively. 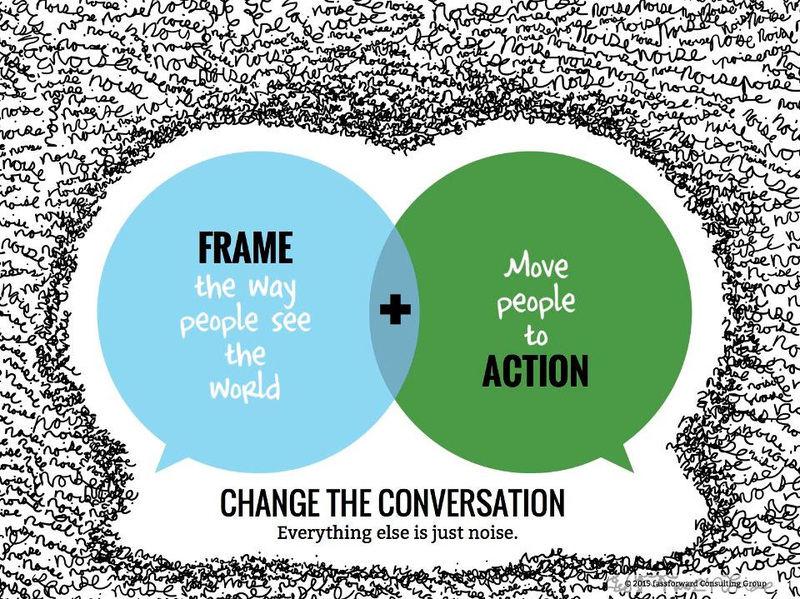 Shifting from words to action requires intentional introspection and courageous honesty, because every organization and every human being has invisible, often unconscious tensions that are beneath what’s presented on the surface. The iceberg is a good metaphor that reminds that our world-views, values, beliefs (sometimes known as blind-spots) impact our behaviors. Our words and behaviors are the tip of the iceberg. Blind-spots/implicit biases often live in the unconscious mind and are laden with cultural beliefs and values, so we need support to see them. Following up with intentional structures, processes, and policies allow for organizational blind-spots and habits to shift. There are countless ways and areas to measure organizational blind-spots and ensure congruence in vision, values, and action. Who is the face of your organization? What is the first thing people see when they visit your website? Heterogenous or homogenous groups of people? Videos that include multiple perspectives? Do you have a public statement or image about diversity, inclusion, and acceptance of all that was co-constructed with diverse members of your team? What images, art, and quotes are visible? Are they from folks of diverse backgrounds/identities/etc.? Have you identified core values that are inclusive? Are they visible, known, and referenced regularly? Have you named explicit intentions or goals to lift up multiple perspectives, listen and learn from folks who do not represent the dominant culture of your organization? Do you have intentional structures in place for collaborating/cross-pollinating/connecting across different roles? Do you have intentional structures and processes to lift up specific perspectives and/or have experiences spot-lighted? Have you appreciated members of your team for their unique contribution and perspective that adds value to the organization? When you’re at a speaking engagement or hosting an event, what’s the first thing people see/hear when you introduce your team? Do you regularly seek advice and/or thought-partnership from an outside perspective? This is Just the Tip of the Iceberg (sorry, pun intended–I couldn’t resist). If you found yourself reflecting on the above questions and feeling like you have work to do, you’re not alone. I encourage you to take a deep breath with me and know that this process is ongoing and complex. 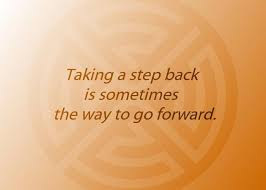 You’ve already taken the first step – awareness. As a leader, you know that–try as you might, you can’t always be in control, but with humility and effort, you can have a tremendous influence on making workplace as inclusive, diverse, welcoming, unique, collaborative, and as productive as possible. In order for deep, meaningful, and lasting change to occur, as a leader, you must become aware of what’s really at play, and then commit to addressing the root cause of WHY pitfalls may occur or continue to persist. And that takes time, discipline, dedication, and support. And remember, you’re on track. Implicit biases are normal. We all have them. Once we’re aware and clear about our blind-spots, then we can become more conscious of how to interrupt and counteract those biases and develop new practices. Respecting diversity and inclusion takes intentional and strategic moves. AND there are ways you can raise awareness of your blind-spots. The SPARK Acronym helps us with that. Biases and blindspots are more likely to be acted upon under stress, time-crunch, pressure, cognitive overload. 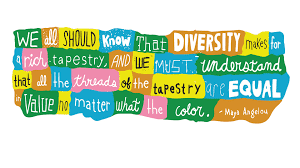 How do I intend to truly honor and respect diversity and inclusion? Am I listening to the individuals and the signs/information from my system? Am I suspending judgement and being open-minded? Am I showing curiosity rather than certainty? Human contact matters–whose perspective is not at the table? Whose point of view am I not paying as close of attention to? Am I exposing myself to as many perspectives as possible? Am I creating and seeking out different narratives (with non-stereotypic imaging)? Am I trying new processes and structures that open up new possibilities? Am I letting go of control and designing experiences that consistently lift up other points of view? Creating awareness and making a shift sometimes requires help. I offer leaders coaching and trainings to help them springboard into more diverse and inclusive leaders. Embracing the unique strengths and assets that each leader has, which in turn helps them lead authentically with intentionality, conviction, confidence. Increasing comfort navigating the transitions, tensions, and complexities of their organization. Download my new S.P.A.R.K. Leadership Self-Assessment here, apply for our upcoming leadership program here, and/or connect for virtual coffee with me here to learn more about my coaching/workshops/etc. Was there anything that resonated? Anything this blog sparked for you? OR, do you have favorite quotes/articles about blind-spots and biases? S.P.A.R.K. was founded in 2016 by Rachel Rosen, a seasoned facilitator, racial equity leadership coach, and LGBTQ advocate. S.P.A.R.K. offerings sit at the nexus of Rachel’s personal and professional passions, and she is on a mission to bring more empathy to the world, one conversation at a time. With a Masters from Stanford, and extensive training in leadership, coaching, team and organizational development, S.P.A.R.K. experiences are grounded in theory and practice. S.P.A.R.K. offers experiences that support leaders and teams to unleash their potential to facilitate powerful experiences, collaborate, and build trust. Don’t Be Blindsided: Lead With A S.P.A.R.K. We All Have Blind-spots. Leaders Have a Responsibility To Check Them. In drivers education, one of the first lessons a new driver learns is about blind spots. “Check my blind spots” becomes a mantra derived from the fear of impending disaster should you fail to check. Good drivers check blind spots as an intuitive, subconscious behavior developed out of repetition. Developing new habits requires a commitment on action. For example, if you are not a runner, but want to successfully run a marathon, you have to train. You think big, start small, and act now. Continuous actions, built upon over time, eventually creates habits. By the time the marathon has been completed, running is habitual. Similarly, for adaptive leaders, there are certain habits that must be internalized if we want to be experienced as emotionally and socially intelligent leaders with a commitment to inclusion. This is designed to be a conversation starter about unconscious biases and blind-spots for leaders and/or people committed to a diverse (multicultural, multigenerational, multiracial, etc.) team. Given the sociopolitical landscape, I don’t need to remind you that there are extra layers of tension in the dynamics and relationships of our teams. I believe that if we want to effectively engage the talents of our diverse communities, facilitate collaborative teams, and foster an environment that fuels productive change–it’s imperative that we have habits around checking our blind-spots. This starts by accepting and acknowledging that we all have blind-spots. Because my background and training as a leadership coach and facilitator is specifically in racial equity and inclusion, I see implicit biases as our greatest blind-spots in leadership. Implicit biases are the attitudes or stereotypes that affect our understanding, actions, and decisions in an unconscious manner. (See more here) Unconscious and involuntary in nature, they often reflect cultural values from our upbringing rather than our current declared beliefs. And these biases can often be expressed in ways that are at odds with our intentions or values. In my work, I see the manifestation of unconscious biases in leadership practices and systems-design everyday. To be clear, unconscious biases are the opposite of conscious, explicit biases. The important thing to note about unconscious biases is that they can be experienced as harmful, hurtful, and discriminatory (to say the least) by marginalized communities. My friend and colleague Zaretta Hammond (the author of Culturally Responsive Teaching and the Brain), recently reminded me of some important points, especially for Caucasions reading this: most “white” people have inherited a culture that’s individualistic (not collectivist like many Communities Of Color), which means that white people (like me) are prone to unconscious deficit ideologies that are experienced as micro-aggressions by People of Color. It’s important to name that, because misrepresenting or misidentifying implicit / unconscious biases is problematic. So, for the sake of clarity, in this blog I refer to “blind-spots” interchangeably with “unconscious / implicit biases”. I am writing a much larger piece on this, but for now, consider these reflections the tip of the iceberg. I believe that, as leaders, we must work intentionally and diligently to illuminate their existence–in service of having positive, productive relationships at work and home. Developed from our tribal or herd mentality, implicit biases are mental constructs to keep us “safe”. Because stress activates the “fight, flight, or freeze” mechanism in our brain, the messages we’ve been exposed to–and internalized–throughout our life expose themselves under stress. This topic is imperative to discuss now, because we are in a hyper-sensitive, emotionally-charged time. The presence of our president has amplified divisions in our country, and people are discussing racism, homophobia, prejudices, and bigotry in a much more open fashion than I’ve ever experienced. Now, more than ever, it’s imperative that we as leaders engage in deeper self-reflection, because biases and blind-spots will surface in our communication if we’re not intentional. Exploring our blind-spots is important because our team depends on us to show self-awareness, thoughtfulness, and be inclusive in our language. Leaders can’t afford to be experienced at odds with their intentions and core values. That’s how relational trust gets ruptured. If you say you are committed to diversity, and you want employees to feel seen, heard, and supported; however, in a moment of stress, your unconscious biases are alive and strong, your actions and words may not be experienced as inclusive. Worst-case scenario: you unintentionally offend someone of a different background (race / gender / sexual identity / generation / body-type) on your team because of something you say or do. The impact of that is significant: when employees feel betrayed or unrecognized at work, their neurological reaction is the same as being chased by a lion. David Rock wrote a fascinating article about the neuroscience of feeling left out. The result is unproductive for all parties involved. In a meeting with my diverse team, I had closed off body language (arms crossed, leaned back) when a particular colleague spoke. My intention was not to portray negative energy, but my unconscious bias was in the driver’s seat. One of my African American colleagues raised his hand to speak up, and several white colleagues kept talking and either didn’t see OR ignored his nonverbal communication, and I did nothing to address the situation, because I also didn’t see his hand. My intention was to always facilitate open, liberatory experiences, but that was clearly not his experience. Thankfully my coach held up the mirror for me. I’ve been called “kid”, “young lady”, and “sweetie” by older men in professional settings more times than I can count on my two hands in this past year alone. As a queer woman leader, I’ve had someone laugh in my face after I introduced myself as queer. I’ve been asked countless times about my “husband” or “boyfriend”, prior to sharing my sexuality. Again, these are experiences and conversations with people who have positive intentions and claim to value inclusion. I offer these real-life examples of blind-spots and biases playing out because I think it’s important to add texture to this conversation. AND, even with training and expertise in this department, I will always be a work-in-progress, because uncovering unconscious biases as a leader is nuanced and multifaceted work. I have always had a coach to offer me feedback and support, because I always want to be experienced as a leader who is reflective, self-aware, and someone who holds space for–and includes–all voices. For me, discovering the Stereotype Threat (here’s a quick informative video) engaged me in a different level of responsibility towards being more intentionally and mindfully inclusive too. If we, as a leaders, value inclusion and commit to honoring diversity, it’s imperative that we do intentional self-reflection so our implicit biases don’t show up and send messages that are at odds with our intentions or core values. The last thing we want to do is unintentionally exclude individuals on our team. Many employees are conditioned/socialized to swallow their pain and keep moving forward, and therefore give a little less of themselves. You know how much one employee holding back can impact a team. Just like in drivers-ed, we learn how to use mirrors to help us see in our blind spots. In this case, our mirrors are our support systems. It’s important that we all have people who care about and respect us enough to be our “mirror”. They can tell us the truth about the impact of our actions, communications (verbal and nonverbal), and our decision making. 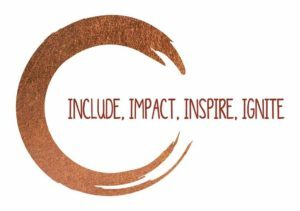 In my leadership coaching programs, I support my clients by utilizing intentional tools and techniques, grounded in latest Emotional Intelligence frameworks/research, for intentional self-reflection–in service of igniting authentic and lasting inclusive conditions. There are ways you can raise awareness of your blind-spots through intentional reflection. The S.P.A.R.K. Leadership Acronym helps us with that. Here are some questions you can ask yourself when reflecting on your blindspots. Biases and blind spots are more likely to be acted upon under stress, time-crunch, pressure, cognitive overload– Have I allowed myself space to pause and breathe? Am I aware of my own triggers? What do I intend to give and get from this interaction? Am I listening with empathy and trying to put myself in their shoes? Ask yourself good questions and be courageously curious. What assumptions am I making right now? Am I suspending judgment and being open-minded? Am I showing curiosity or certainty about someone else’s experience? Human contact matters–who’s not at the table? Am I trying new processes and structures opens up new possibilities? Now I don’t need to remind you that there’s no silver-bullet for lasting transformation. Just like becoming a better driver and internalizing new habits, we must practice frequently if we want to improve our emotional intelligence. Check out my other blog on organizational blindspots here. PS. Fun fact: Did you know that we physically have blind-spots in our eyes? Basically it comes down to the structural makeup of our eyeball. If you don’t know much about this, there’s a really cool science experiment here. Communicate With Intentionality. Lead With A S.P.A.R.K. A lot of folks I work with ask me what they can do differently to communicate with more consciousness and intentionality–especially across difference (race, gender, ethnicity, generation, sexuality, body-type, etc.). A lot of leaders also ask how they can shift the culture and support their team members to speak with less judgement and act with more intentionality and thoughtfulness before making assumptions about other people’s experiences. I often say, model what you hope to see. Show them what it looks like to engage with that level of thoughtfulness. Share your process. In a recent blog, I explored the notion of Intention Deficit Disorder. I shared that there are specific intentional strategies we can utilize to interrupt particular patterns of discourse, and they require a different level of mindfulness and preparation. We address this in our upcoming SPARK Leadership Coaching program. We all have biases–unconscious and conscious. When you are willing to show up fully, and explore your biases, you are more likely to be intentional with your words and actions, and therefore really understand those who have differing values from you. To avoid Intention Deficit Disorder, tune in and notice what’s coming up for you, body language of yourself and the other person, if you are truly listening or just feeling triggering and needing to respond? Setting intention around communication is so critical, especially under the stress and strain from our current socio-political landscape. Neuroscience research suggests that being in a state of distress can lead to unclear thinking and unkind behaviors, so this pause is essential. Rather than assuming someone else’s truth, ask a question. There are many different ways people communicate. Being mindful and open to really listening (after asking) can generate better questions and drive better communication. Seek out different points of view. Be willing to truly listen to other perspectives. Stay curious and committed to remaining present and engaged–especially when someone has a different way of approaching the task at hand. When triggered and experiencing tension and physiological distress, be kind to yourself in the moment, don’t feel pressured to respond right away. One deep breath is often enough space to de-escalate mounting tension. Remember, when you clean out a messy closet, the mess has to come out of the closet in order to get cleaned out and sorted. Working with pain, discomfort, and even trauma gets messy. That’s okay. Be intentional, compassionate, vulnerable, and loving. Sometimes it is okay not to know the right answer. Just stay willing to be a part of the process, and the solution will eventually arise. Think about what connections you can make to your experience now…. What are your thoughts/reactions to the acronym? Which domain do you want to be more intentional around? Do you find it easy or difficult to pause and reflect before responding right away? Do you have any default phrases or statements when you actually don’t know where people stand? If not, then I have some more tips and tools to share! If my blogs resonate, you may be interested in learning more about our 8-week online leadership course. Cohort 3 starts on January 8th! What are your reactions to these blogs about intentionality? Are You Clinging to Perfection or Embracing the SPARK? In a world of over-saturation, created by the ability to have access information immediately through the internet, what sets a business apart is its soul, articulated through its leadership. Yet, few people have the skill-set to embrace and acknowledge challenges, vulnerably and transparently communicating emotions while integrating action that aligns with values. An executive I was coaching was stunned when I shared that two things can be true at the same time— you can be an expert and a learner, you can have a relationship and still manage employees. Culturally, we are ingrained with the narrative that vulnerability is a weakness. Instead, we are driven to perfectionism, and we aim to appear as free as possible from all flaws and defects. Many of us are taught this from childhood. It becomes a mental construct that shapes our narratives about ourselves and others. A new leadership is emerging now, leading with authenticity, emotional intelligence, and cultural consciousness. groundedness in both their own and their teams strengths with openness to learning about necessary areas of growth. Leading this way is complex and nuanced, as you can imagine. This is exactly what adaptive, inclusive leadership is all about. To answer my clients question of where to begin, we start with self-reflection in both our head and heart. Shifting to this is not necessarily intuitive, easy when unsupported, or fostered by the dominant culture. However, not only is it possible, it is very rewarding and impactful for our communities. That’s why I have designed and created S.P.A.R.K. Leadership programs. This journey involves interrupting patterns and confronting incongruences, which shakes us from our comfort zone. Do you know how to navigate complex, nuanced dynamics when they emerge under distress? Are you actively building, strengthening, and sustaining positive relationships with all stakeholders of different backgrounds and cultures than yourself? Do you currently have the knowledge, skills, and habits to be engaged in this new leadership model? Do you take time daily (or even weekly or monthly) to reflect on your core values, vision, and priorities to have maximal and strategic impact? Are you familiar with the latest neuroscience trends and adaptive leadership research and approaches in order to lead with more impact? Are you crystal clear about what each of the five attributes of S.P.A.R.K. look like on a consistent basis? If you answered no to any of those questions, consider joining our leadership retreat (we have one on September 16, 2017! ), check out our upcoming 8 week online course for leaders OR click here to schedule a “clarity call” where we can discuss your personal needs on the journey, and identify what you need clarity around in order to become the adaptive, inclusive leader you want to be. Inclusion starts with I, and also contains the word US within it. Your team needs you to provide the quality of leadership that allows everyone to thrive, and it all starts with taking the first step, and embracing the paradox. Rachel Rosen is a seasoned facilitator, leadership coach, Racial Justice and LGBTQ advocate, and the Founder of S.P.A.R.K. For Humanity, the interactive, inclusive, community-building card game. All S.P.A.R.K. offerings sit at the nexus of Rachel’s personal and professional passions, and she is on a mission to bring more empathy to the world, one conversation at a time. With a Masters from Stanford, and extensive training in leadership, coaching, team and organizational development, S.P.A.R.K. experiences are grounded in theory and practice. 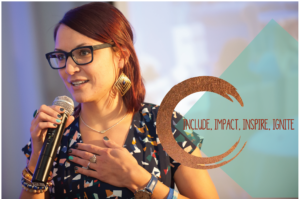 Rachel facilitates workshops and offers adaptive leadership coaching opportunities that support individuals and teams to unleash their potential to ignite inclusive cultures, collaborate, and lead with intentionality–all in service of building a better future for the next generation. There’s no magic wand. To be honest, I have learned a ton about what NOT to do, so I know what seems to work. Every one of my go-to moves exists because of those lessons-learned. 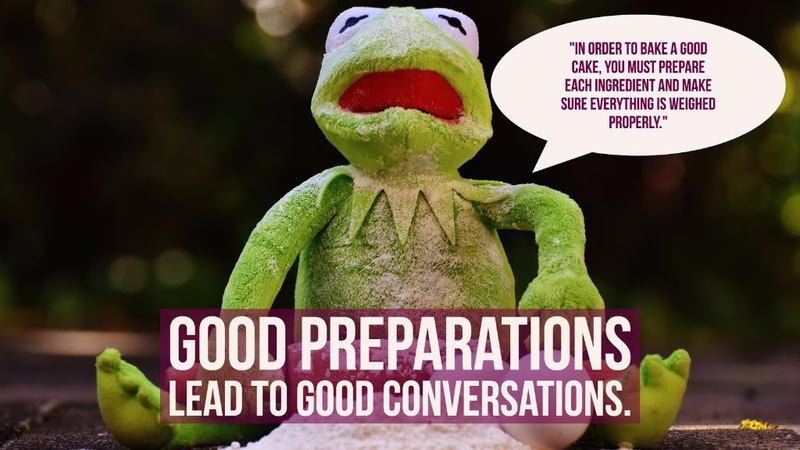 So, today, I offer some reflections and tips to help you when creating conditions for meaningful conversations at YOUR next gathering. The reason I offer this now is because I wish someone would have broke it down like this for me five years ago. These lessons are things that I’ll always continue to work on, and they’re good reminders when I get stuck. They have been formed after many years of guidance from mentors, facilitating engagements on complex topics, and culling through resources, frameworks, and tools in order to create my roadmap. I struggle with the phrase “fake it till you make it”…because it didn’t do me any good. In fact, sometimes “faking it” impacted my relationships and community in detrimental ways. Maybe that’s because I have a terrible poker face. I mean terrible. That said, I believe that people can smell inauthenticity and insincerity from miles away. They’re onto us when we’re faking it. 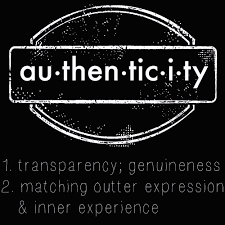 So, why not be authentic and real about where we’re at? People not only appreciate authenticity, but they respect it. Sometimes that involves vulnerability, but that leap of faith is worth it. Even when I’m in a room full of strangers presenting on a topic that isn’t my favorite–I always ask myself–where can I create space for me to be fully MYSELF? When do I feel most confident and comfortable? Only when I share parts of ME do they get to see my passions and joys, which brings me to my next point. But before we go there, here’s a question to consider: Where do I feel I can be my most authentic self, and what about that space is so inviting? Show enthusiasm and passion if you’re feeling it. When you love something, it shows. When you care about something, it shows. I used to think that I had to stick to the script and not show too much of my identity, for fear of messing up. I also used to think that I had to keep a calm, cool, and collected demeanor to appear “professional” or “knowledgeable”…but then I learned one of my biggest lessons. I can have fun and be very knowledgeable. I can be strong and graceful. I can have both confidence and be vulnerable at the same time. I now know that it’s better to bring my full self and be transparent with my emotions rather than be “buttoned up” and appear put together. Also, my excitement sets the tone. 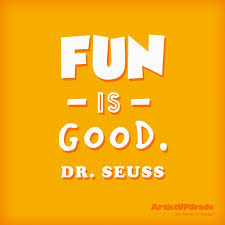 If I want other people to have fun, then I need to do so as well. A question to consider: What is one thing that brings you joy when you’re leading or hosting a gathering? 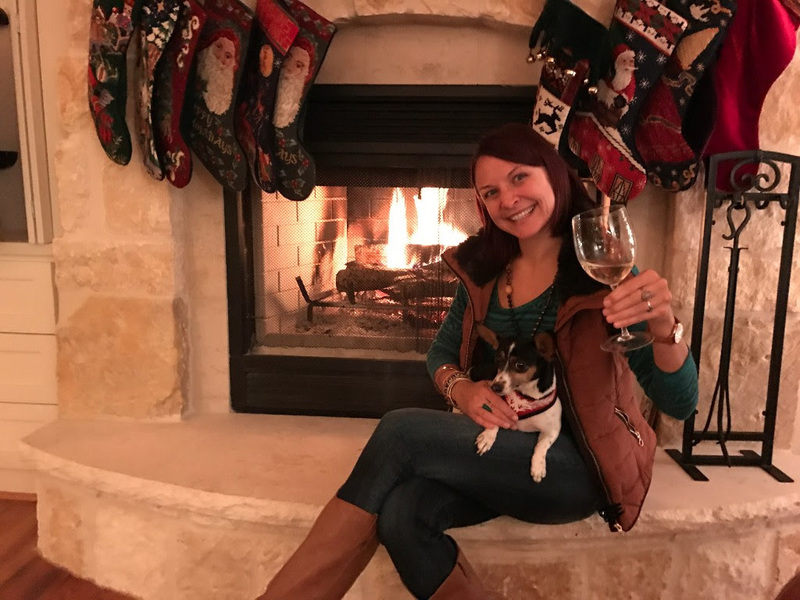 When I’m preparing for an upcoming gathering, I think about how I want to experience the day, and what I want the experience to be like for my guests. I think about how I can support people into, through, and beyond the experience so they feel fully welcome and seen….and that level of support takes preparation. I personally always want to design experiences that allow for folks to tap-into something inside of them so they can unleash their full potential. So, when I visualize experiences, I imagine people laughing, leaning-in, smiling, and sharing meaningful connections. Then, I think about how to create space for those things (above) to happen. One of my biggest lessons-learned here is that being prepared is very different than being attached to a plan. A question to consider: How do I want to FEEL at the end of the gathering? How do you want your guests to walk away feeling? How I set up the experience impacts everything. This brings me back to points #1 and #2. For example, if I want people to feel comfortable, have fun, and feel loving energy…then I need to show up confidently in those ways. When I attend events and gatherings, I like to hear from the host. I particularly appreciate hearing why they chose to put on the event. A question to consider: Think of an event that was framed really well and allowed you to feel like you could show up as your full self…what did they say? What was it about their opening that impacted you the most? I mentioned in my first post on Tuesday that I used to be a perfectionist and control gave me comfort. In hindsight though, I realize that by controlling too much, I didn’t allow for people’s natural leadership. In relinquishing control and stepping back, I was able to see their strengths, assets, gifts, and talents. Naturally people stepped up. Sometimes we become the person we despise the most. Think about a time when you felt micromanaged or a time you went to a gathering when the host needed to control everything. What do you wish they would have done differently? 3) Close the event with as much care as you opened it. A question to consider: When was the last time you wanted to speak up but you stepped back to let others share instead? What happened as a result? Making space for multiple perspectives to be shared is part of the process. Positions of power and authority don’t help meaningful conversations bear fruit. Especially if I’m hosting a gathering with folks of different racial backgrounds, it’s important that I acknowledge difference when it feels appropriate, and check my assumptions. When multiple perspectives are shared and there’s space to ask questions about other people’s experiences, I always learn something new. Here’s the thing: we need each other to be better community members. The first step to singing in harmony is in truly listening to one another, which takes me to my next point. A question to consider: What are your go-to questions or moves you have to ensure that you’re not making an assumption about another person’s identity? Listening with curiosity is no small feat. Listening with not just my ears–but also my eyes, my heart, my open-mind–that requires a different skill. I mentioned this in my post on Wednesday when discussing courage, but being present and truly listening–that is a gift. A question to consider: Can you think of a time when you heard something you didn’t agree with, but instead of judging you chose to pause and be curious–rather than certain–about someone else’s experience? I offer this reminder toward the end of my list, because once #1-7 are in place, this fits right in. For centuries people have connected and solved problems by sharing experiences and telling stories. We don’t need an App or screen or even a tool. Often times, all we need is ourselves, our openness, and our curiosity. 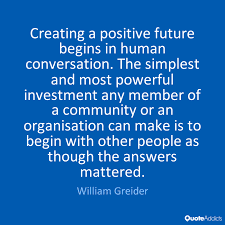 A question to consider: When was the last time you hosted a conversation that was especially meaningful and fulfilling? What was it about that conversation? What was in place that made it so great? Whatever messy means to you, expect a little bit at some point, and you’ll likely feel more prepared if and when the energy in the room shifts. Anticipate tension. Here’s the letter I shared the other day in case it’s helpful to remember. If you don’t like “messiness” or tension, sometimes it helps to list out all the “worst case scenarios” just to get them out of your head. Then consider this: Is there anything on the list you haven’t experienced before? Anything you don’t know how to handle? Likely the answer is no. You have what it takes to get through even the WORST CASE SCENARIO. That’s remarkable actually. At that point, feel free to rip up your list or throw it away. Let your anxieties go, and remind yourself that messiness and struggle help communities grow. “All meaningful change starts on the inside” -Dr. Martin Luther King Jr.
A big assumption I used to make was that everything would be fine just because the right people were in the room. As a host of an experience, I have found that setting an intention–for how I want to be experienced–helps me. Then, throughout the day, when I allow myself to slow down, think, and reflect back on that intention…I notice a big difference. Here’s a sentence to try completing: For my upcoming gathering, I intend to be_____and I want people to experience me as_______. If you’re interested in being a part of an exclusive fireside chat with Lia and I tomorrow morning, we’ll be sharing our conversation with you about closing out 2016 strong and reflecting on intentions for 2017. Keep a look-out in your inboxes in the next 24 hours! In addition to announcing who the winners are (of the awesome raffle prizes) tomorrow…we’ll be sharing a special video from our hearts to you!! What stood out or resonated today? What’s one thing you want to try out this next month? What else would you like to hear more about? As I close I want to appreciate and recognize the sources that played a big role in helping me create this list. My mentors at the National Equity Project have played a tremendous role in my leadership development. 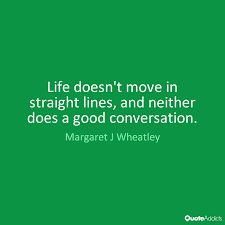 Another resource that has been very formative for me is called the Art of conversation, Adopted from Arrien, A. (2001) “The Way of the Teacher: Principles of Deep Engagement” in L. Lantieri, Linda. Schools with spirit : nurturing the inner lives of children and teachers. Beacon Press, Boston.